Another entry from Richard Rolle’s 14th century Christian classic, The Fire of Love. A glimpse of the afterlife. There is no greater image of heavenly joy and flourishing than music. Therefore all those who are filled with love and joy, the seekers after inextinguishable heat, unite to sing in one glorious choir of rich melody; and now this company of friends has the shade of heaven to protect them against the scorching of lustful flattery and ill will. The very fervour of their sweet love ravishes them with the sight of their Beloved. Flowering through this loving flame into all virtue they rejoice in their Maker. Their mind is changed and passes into lasting melody. From now on their meditations become song. Melancholy has been driven out of the mansion of their spirit, and it now resounds with wondrous melody. The one-time torment of their soul has vanished, and now in glowing health they dwell in the heights of harmony, in the wonderful rhythm of sweet and melodious meditation. –Translation and copyright 1972 by Clifton Wolters. Penguin Classics. I didn’t know about a connection to the royal wedding until just now. Rev. Michael Curry’s sermon at that historic event has an ancient and deeply spiritual heritage. Here is a second passage from Richard Rolle’s 14th century spiritual classic, The Fire of Love. The prologue is one of the few places where Rolle speaks of the personal aspect of his experience plainly, not using generalities about “they” and “those” who experience the fire of love. I will write more in an afterword below. You want to get right to Rolle. I cannot tell you how surprised I was the first time I felt my heart begin to warm. It was real warmth too, not imaginary, and it felt as if it were actually on fire. I was astonished at the way the heat surged up, and how this new sensation brought great and unexpected comfort. I had to keep feeling my breast to make sure there was no physical reason for it! But once I realized that it came entirely from within, that this fire of love had no cause, material or sinful, but was the gift of my Maker, I was absolutely delighted and wanted my love to be even greater. And this longing was all the more urgent because of the delightful effect and the interior sweetness which this spiritual flame fed into my soul. Before the infusion of this comfort I had never known such warmth, so sweet was the devotion it kindled. It set my soul aglow as if a real fire was burning there. Yet as some may well remind us, there are people on fire with love for Christ, for we can see how utterly they despise the world, and how wholly they are given over to the service of God. If we put our finger near a fire we feel the heat; in much the same way a soul on fire with love feels, I say, a genuine warmth. Sometimes it is more, sometimes less: it depends on our particular capacity. What mortal man could survive that heat at its peak–as we can know it, even here–if it persisted? He must inevitably wilt before the vastness and sweetness of love so perfervid, and heat so indescribable. Yet at the same time he is bound to long eagerly for just this to happen: to breathe his soul out, with all its superb endowment of mind, in this honeyed flame, and, quit of this world, be held in thrall with those who sing their Maker’s praise. But some things are opposed to love [caritas, i.e., divine, unselfish love]: carnal, sordid things which beguile a mind at peace. And sometimes in this bitter exile physical need and strong human affection obtrude into this warmth, to disturb and quench this flame (which metaphorically I call “fire” because it burns and enlightens). They cannot take away what is irremovable, of course, because this is something which has taken hold of my heart. Yet because of these things this cheering warmth is for a while absent. It will reappear in time, though until it does I am going to be spiritually frozen, and because I am missing what I have become accustomed to, will feel myself bereft. It is then that I want to recapture that awareness of inner fire which my whole being, physical as well as spiritual, so much approves; with it it knows itself to be secure. –From Prologue in The Fire of Love by Richard Rolle. Translation and copyright 1972 by Clifton Wolters. Penguin Classics. Rolle says here that he uses “fire” metaphorically because it both burns and enlightens. Who would want to experience a “burning” sensation? Yet when we desire something or someone deeply, the sensation is more like a burning than anything else, isn’t it? —As thousands of poems and pop songs testify. Not a “heartburn” that you simply want to go away; more like a boiling that says “Something has got to happen; either I am going to explode in song and dance or I am going to quench this fire.” God is the greatest object of desire, the deepest satisfaction of the soul. It makes sense that desire for Him would be greater than any other desire. I tend to think of desire-love as eros, following C. S. Lewis’s description in his book The Four Loves, and thus second-rate compared to agapé or divine, self-sacrificing love, which does what is best for the beloved, not seeking satisfaction of one’s desire. But Rolle and similar mystics bring me up short. How can this fire of love be a divine form of love if it is desire? So this is a paradox. 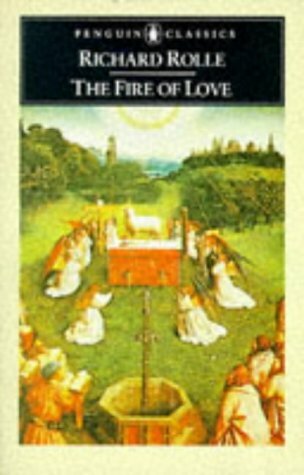 Perhaps we might say that this “fire of love” is a kind of “eros” transfigured, desire for something that nothing in this world can satisfy but still cousin in its bodily sensations to earthly desires. And this seems to be what Rolle is indicating. Augustine or others are often credited with writing “Each person has a God-shaped hole that only God can fill,” and Pascal did say something along these lines. But actually, the thought originated with Rolle in this book: “Since the human soul is capable of receiving God alone, nothing less than God can fill it; which explains why lovers of earthly things are never satisfied” (chapter 11). Have you every experienced the fire of love? I have been to another world, and come back. Listen to me. Near the beginning of his experience, Alexander finds himself flying without an aircraft over a paradisical land. Assuming it is true and not a hallucination it reminds us that mystic wonder has more to do with people than place. And it gives a rock solid glimpse of what “higher and holier” means. Someone was next to me: a beautiful girl with high cheekbones and deep blue eyes. She was wearing the same kind of peasant-like clothes that the people in the village down below wore. Golden-brown tresses framed her lovely face…. The girl’s outfit was simple, but its colors–powder blue, indigo, and pastel orange-peach–had the same overwhelming, super-vivid aliveness that everything else in the surroundings had. She looked at me with a look that, if you saw it for a few moments, would make your whole life up to that point worth living, no matter what had happened in it is so far. It was not a romantic look. It was not a look of friendship. It was a look that was somehow beyond all these…beyond all the different types of love we have down here on earth. It was something higher, holding all those other kinds of love within itself while at the same time being more genuine and pure than all of them. In the end of the book, Dr. Alexander, who was adopted as a baby, is given an old photo and discovers this girl is his birth-sister whom he never knew. 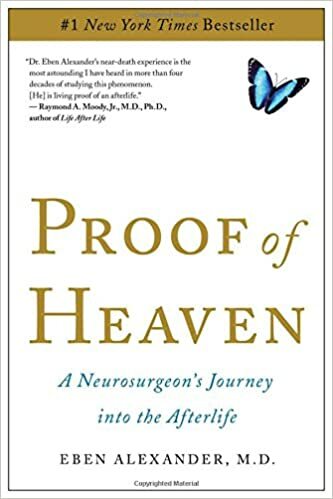 —Proof of Heaven: A Neurosurgeon’s Journey to the Afterlife, by Dr Eben Alexander. New York: Simon & Schuster, 2012. Copyright 2012 by Dr. Eben Alexander. All rights reserved. This is the type of mystical experience that leaves us in fear and trembling. This passage is the Grandaddy of that type. In the middle of the desert a lone mountain rises up. It is called Sinai. The Israelites camp at the base, and Moses climbs up. Somewhere along the way, God calls from the mountain. God tells Moses to remind the people below how God rescued them from the Egyptians to “be my own little flock….a kingdom of priests to God, a holy nation.” The context is important. God appears with fire and thunder in the passage below, and then he gives to Moses the commandments for creating that reverent and just society: a holy nation. God appears once again without disguise, even the disguise of a burning bush. This aspect of holiness that we see in Exodus 19 is unpopular or unknown these days, even despised–even among Christians, Jews, and Muslims, sometimes. To believe someone is so different from us, so set apart (one of the meanings of “holy”), so much better than we are, may defy our democratic principles. It certainly hurts our egos. But unless we understand this aspect, we cannot understand how infinitely morally good God is compared to us. But when we do understand it, we also get a glimpse of how much love and humility is poured out in the life and death of Jesus Christ. We understand why we need Jesus, why he is “the way, the truth, and the life,” the end as well as the means. We understand that only a man who was God, and a God who would become a man, could bridge that awe–full gap between us and God. Moses returned from the mountain and called together the leaders of the people and told them what the Lord had said. They all responded in unison, “We will certainly do everything he asks of us.” Moses reported the words of the people to the Lord. So Moses went down to the people and sanctified them and they washed their clothing. On the morning of the third day there was a terrific thunder and lightning storm, and a huge cloud came down upon the mountain, and there was a long, loud blast as from a ram’s horn; and all the people trembled. Moses led them out from the camp to meet God, and they stood at the foot of the mountain. All Mount Sinai was covered with smoke because Jehovah descended upon it in the form of fire; the smoke billowed into the sky as from a furnace, and the whole mountain shook with a violent earthquake. As the trumpet blast grew louder and louder, Moses spoke and God thundered his reply. So the Lord came down upon the top of Mount Sinai and called Moses up to the top of the mountain, and Moses ascended to God. What we see in the Exodus passages are people meeting the awesome strangeness and other-ness of God—an experience of the Numinous, as Rudolf Otto described it. In Genesis after the Fall, God shows up only in disguise, so to speak: as a voice, as angels, as a vision while asleep. In Exodus the mission is apparently so critical that he shows up without disguise. There is so much at stake: His people must know who He is; hundreds of thousands of them must walk out of Egypt not only unscathed but rich; Pharaoh’s gods and magicians must be publicly defeated; the people must never forget this God is their rescuer and redeemer who can do absolutely anything; a new nation with unprecedented laws of justice, mercy, and reverence must begin, a way of life that God intends to spread over the earth and end evil forever. This is also the momentous time when God reveals his true, personal name, not a title. Often transliterated from the Hebrew as YHWH, it is mysterious and so is its pronunciation. But it seems to mean “I Am Who I Am,” that is, the self-subsistent one; the only one that cannot be compared to or depend upon anything else. Moses was shepherding the flock of Jethro, his father-in-law, the priest of Midian. He led the flock to the west end of the wilderness and came to the mountain of God, Horeb. The angel of God appeared to him in flames of fire blazing out of the middle of a bush. He looked. The bush was blazing away but it didn’t burn up. God said, “I’ve taken a good, long look at the affliction of my people in Egypt. I’ve heard their cries for deliverance from their slave masters; I know all about their pain. And now I have come down to help them, pry them loose from the grip of Egypt, get them out of that country and bring them to a good land with wide-open spaces, a land lush with milk and honey…. God continued with Moses: “This is what you’re to say to the Israelites: ‘God, the God of your fathers, the God of Abraham, the God of Isaac, and the God of Jacob sent me to you.’ This has always been my name, and this is how I always will be known. A whole week goes by. This is terrible! I promise you this blog is not dying on the vine. I had a lot of travel and extra duties this past week. Today we have, as promised at the start of this blog, mystical experience straight from the Bible itself. You cannot buy this stairway to heaven. This intermittent series will be published in chronological order and today’s is from Genesis. My selections will naturally beg the question, “What is a mystical experience?” Why, for example, am I starting with Jacob and not Abraham to whom God spoke? Adam walked with God in the garden of Eden–what more amazing experience of God could there be? My criteria are open to suggestions and adjustment at any time, but one of them is to choose those that include a deep emotional experience by the recipient. For like it or not, our emotions create motion; they move us and create change. Experiences like these are not merely ancient legends. God still sends life-changing visions to people when they are awake and when they are asleep. They have happened to me and many others. Have they ever happened to you? Write it to me and I may publish it here. You may be anonymous if you wish. Jacob left Beersheba and went to Haran. He came to a certain place and camped for the night since the sun had set. He took one of the stones there, set it under his head and lay down to sleep. And he dreamed: A stairway was set on the ground and it reached all the way to the sky; angels of God were going up and going down on it. The Message, translation and paraphrase by Eugene Peterson. Painting: Circa 1490 (oil on panel) by the French School (15th century), Musee du Petit Palais, Avignon, France.